“Show me other ways to activate” is disabled? I have installed an instance of Win Server 2008 R2 on a Virtual machine. This machine is purposefully on an isolated environment (no internet) for testing purposes. I need to activate the machine and I have my MSDN key ready to go. I just ran through the same steps with a Windows 7 VM, and was able to register using an automated telephone service from Microsoft. Google pointed me to people experiencing this issue but the only workarounds I saw where to use the internet (not an option for me). Does anyone know how to enable this option? Open an elevated command prompt and run slui 4. That will start the "Activate by Phone" option manually. Fortunately, they posted the exact solution on the Core Team blog. Unfortunately, its not as pretty as it used to be. Good luck! View your Installation ID slmgr.vbs -dti Tip: The Installation ID is a 9x6 number. An easy way to split it up so it is easier to read back to the phone activation system is to hit CTRL-C to copy the contents of the dialogue box and paste into notepad. In notepad it will be broken out into the 9x6 groups and easier to read. My suggestion is you register your OVA image online and then import it to an off-line environment. Ss for the registration you run in windows help system "how to activate windows": it will bring you the link to a dialogue to activate it, click OK and it will say activated for 180 days (after connecting to windows.com most likely). Not the answer you're looking for? Browse other questions tagged windows-server-2008-r2 activation or ask your own question. Upgrading hardware and converting current host OS to a VM - any catches? 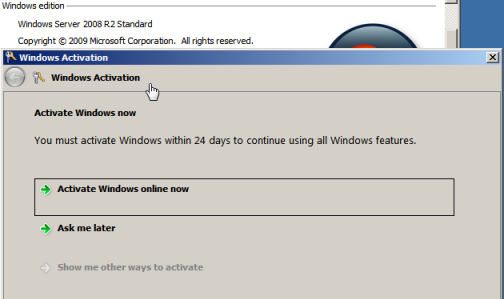 Windows Server 2008R2 Virtual Lab Activation strategies?